For an island that is blessed with so many beaches, swimming is a hobby for many but a serious sport for very few. Indeed the aquatic sport of preference in Malta remains waterpolo, at least among men, with only a small fraction opting to focus on purely on swimming. Even so, performances are improving and last year saw the first Maltese swimmers qualifying to the Olympics by right after hitting the pre-set qualification standards. That mark was achieved by the Australian born Ryan Gambin whose series of fast times have forced the rest of the field to raise their targets. So it is that in swimming, whereas athletes previously could rely on a local best to qualify now it is clear that they will have to hit the qualification marks in order to guarantee their place at the Olympics. It is that ambition which should inspire the next generation of Maltese swimmers, a group of which set a whole host of new national and age category records in a meet in Berlin held last December. That these records – thirteen in total - were spread across a variety of age categories and distances further strengthens the belief that there is the raw material for local swimming to keep on improving. Certainly one who formed part of that group and with every intention of keeping up his progress is Daniel Galea. In Germany he managed to trash a twelve year old record in the Group C age category with his 1:12,48 in the 100 metres breast-stroke being 0.48 seconds faster than the previous best. This was then followed up with another record in the 50 metres breast-stroke in a time of 00:32,79. Yet that wasn’t enough. As soon as the new year was a few days old, he once again improved his time in the fifty metres breast-stroke, lowering it down to 00:32,56 and at the same time setting a new Group D record. All of this might seem like the pedantic, statistic laden speak that is likely to excite sports addicts but leave anyone else indifferent. So let’s put it in another way: this is a kid who broke two national age category records in mid-December and, rather than partying his way through the Christmas holidays as most of his peers did, kept on training hard so that at the first opportunity he could be in a position to break yet another record and keep on his progression. Because that is part of the story of so many Maltese sports-people that never seems to get told: they work extremely hard to obtain whatever results they manage to achieve. This is immediately apparent as Daniel starts explaining his training schedule. It is a hard slog for anyone, let alone a teenager who has to find the self-discipline to keep it up for eleven months of the year regardless of the weather. 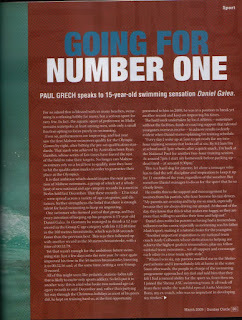 Yet, somehow, Daniel manages to do so for the sport that he clearly loves thanks also to the support that he receives. His parents have been an influence in Galea’s career in more ways than one: swimming for Galea was almost a natural choice seeing that it was his father’s sport. So has he ever thought of giving up? Does he ever wonder why he puts himself through all of this? And therein lies the path to success. If Daniel – and those like him – can keep their focus and determination strong enough to keep on searching to achieve their goals, then they will make it. No longer would there be the need to look abroad for a ‘Maltese’ athlete of a good enough caliber: those being bred at home would be more than good enough. This article was featured in the March 2009 issue of Sunday Circle magazine.